If you are interested in getting your National Registry EMT B certification as well as your State of Alaska EMT 1 certification we have great news for you. 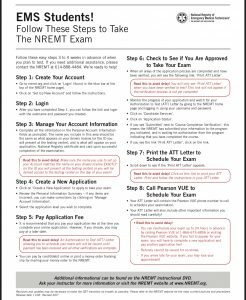 If you wish to obtain a NREMT certification: upon them completing your EMT-1 course and successful completion of the State EMT-1 psychomotor exam you only need to successfully complete the NREMT EMT exam. You do not need to take the State exam, the State of Alaska will accept your successful passing the cognitive exam as meeting the state cognitive exam.